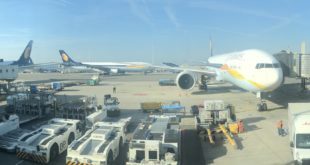 This is the third in a three part article of my trip from London to Bangalore. After getting off my flight from London, I had a horrible headache courtesy my disturbed sleep on the flight. Our plane seemed to have parked at almost the last gate at the terminal and the transfer security was on the other end of the terminal. After a very long walk, I reached the transfer security hall, where there was only one x-ray and one body scanning line open. The line was being run by a super rude Filipino guy who was going out of his way to be rude to every passenger who came through the scanner. Aside from the rude security assistant, one scanner for an entire A380 load of people (assuming ours was the only flight being transferred at that time) is definitely not enough especially with the tight connections Etihad sells. Fortunately since I was one of the first to reach the security check I was through in about five minutes but as I was leaving, the line had grown massively. The transfer security exits into the duty free area, from there I proceeded to the connecting gate which was half way back in the direction I had just come. Since it was nearing the boarding time printed on the boarding card, I skipped the lounge and headed straight to the gate. I reached the gate about five minutes after the printed boarding time and boarding had not yet begun. After waiting for another 20 minutes, the gate agents finally started calling boarding – a full 25 minutes after the printed boarding time. Nothing annoys me more than an airline forcing everyone to come to the gate early and then not start boarding, if you print a time on the boarding pass then stick to it. When the agents called boarding, they called priority boarding and I was the second in the queue. After scanning the boarding pass of the lady in front of me, they announced to the queue that the business class bus had not yet reached. Another agent then came down the line asking passengers if they would like to take the bus which was waiting now or wait for the separate bus (which is the same type of bus, just to be used only by business class passengers). Not surprisingly everyone I saw chose to get on the bus already at the door. The bus drove us to our A320 which was parked near the end of the airport. 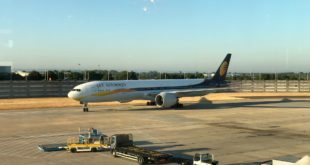 Abu Dhabi (AUH) to Bangalore Kempegowda International (BLR). EY 286. STD 02:40 STA 08.15. All times local. 17-Jul-17. I boarded via the front door and was greeted at the top of the stairs by one of the cabin crew and escorted to my seat. 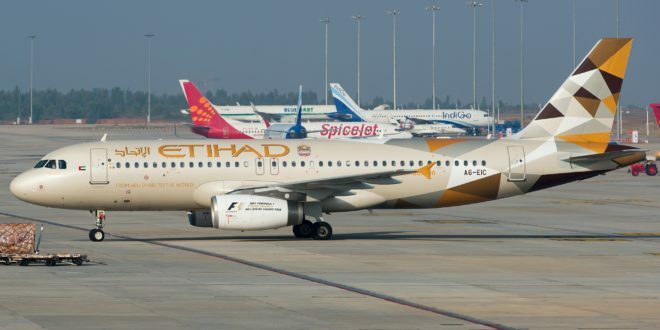 The A320 we were flying on had been refurbished with the new Etihad colors. 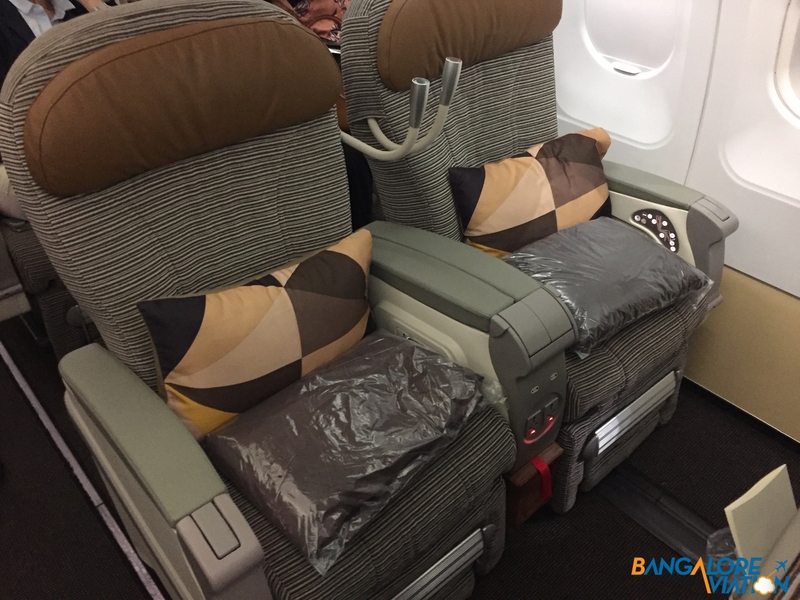 The aircraft has four rows of business class seats in a standard 2-2 arrangement. I found the seat to be sufficiently wide with a lot of leg room. The seat also has a decent recline and foot rest. Upon taking my seat, I was quickly offered a drink. I took a lime and mint juice. I was also asked what drink I would like after takeoff. 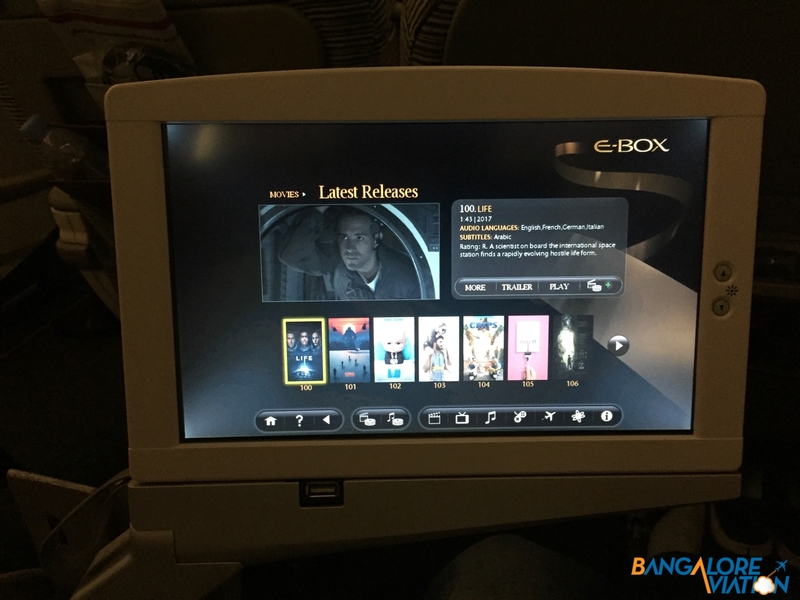 The center armrest holds the fold out screen for the IFE which has a reasonable selection of content with Etihad’s older entertainment system. 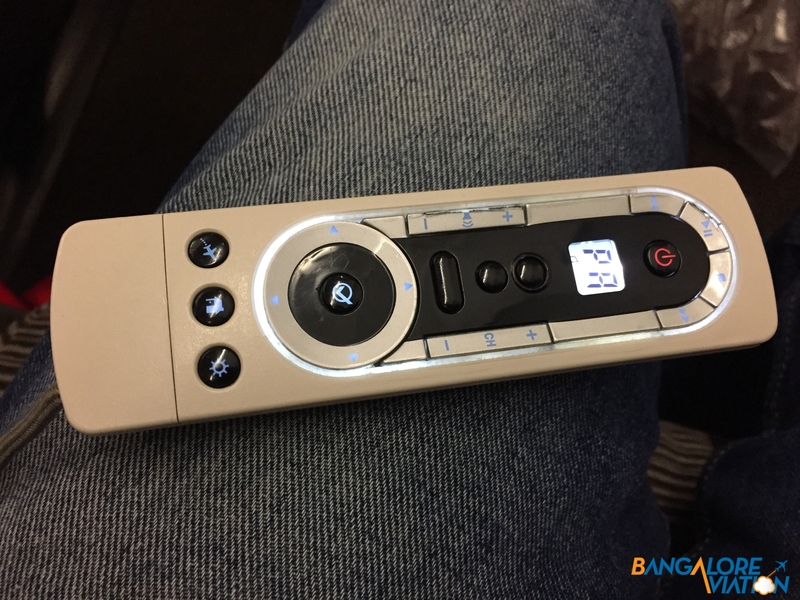 The system can be controlled with a remote stowed in the opposite armrest. Unfortunately being a fold out screen, it must be stowed for taxi, takeoff and landing. The fold out IFE screen. 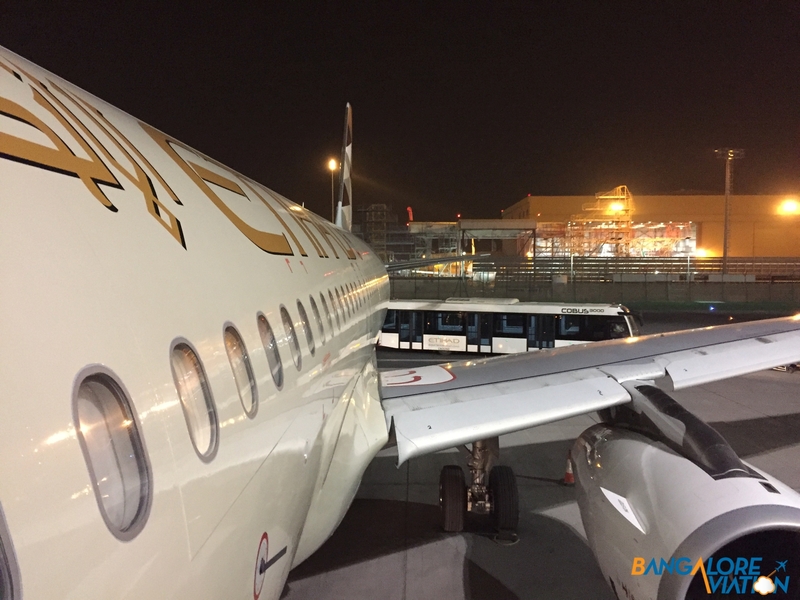 After boarding completed, the pilot came over the PA and announced that due to congestion over Oman, pushback would be delayed. The aircraft began it’s push back 20 minutes after the scheduled departure time. After pushing back, the aircraft taxied towards the main taxiway and stopped. We then waited on a cross taxiway for another 25 minutes while other larger aircraft taxied past and took off – it would have been interesting to know why our flight had low priority to take off was it just because we were in a smaller aircraft or are all flights to India lower priority or was the tower just waiting for a slot since we would have missed our original departure slot. We took off about 50 minutes after our scheduled departure time. Soon after takeoff the steward returned with my drink order and took down my dinner order and asked when I would like to dine. I requested him to bring my dinner after an hour which was done almost to the dot. My first course was virtually identical to the flight from London, but missing the excellent bread. Again the mezze plater was average with nothing to write about. 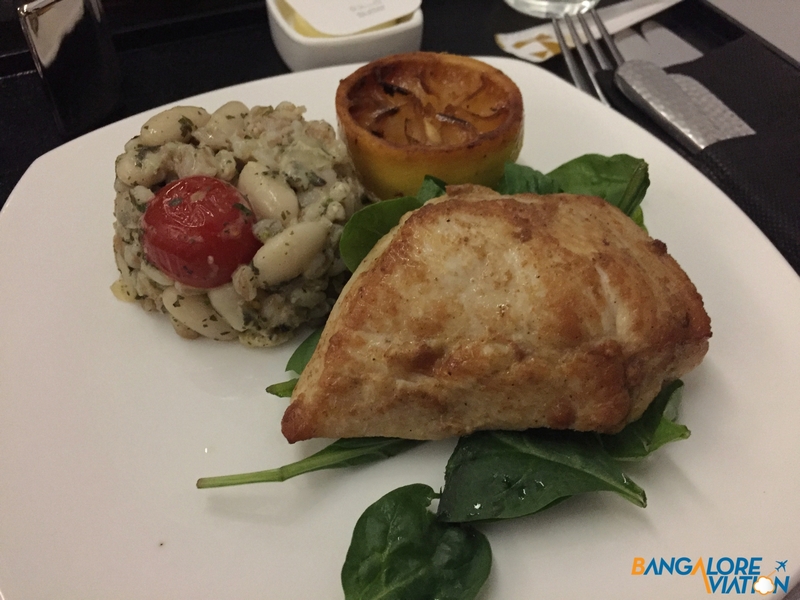 The main course was a grilled chicken breast which had some flavour but was about as soft as a hockey puck. The dessert was a chocolate cake with raspberry compote which was very good. 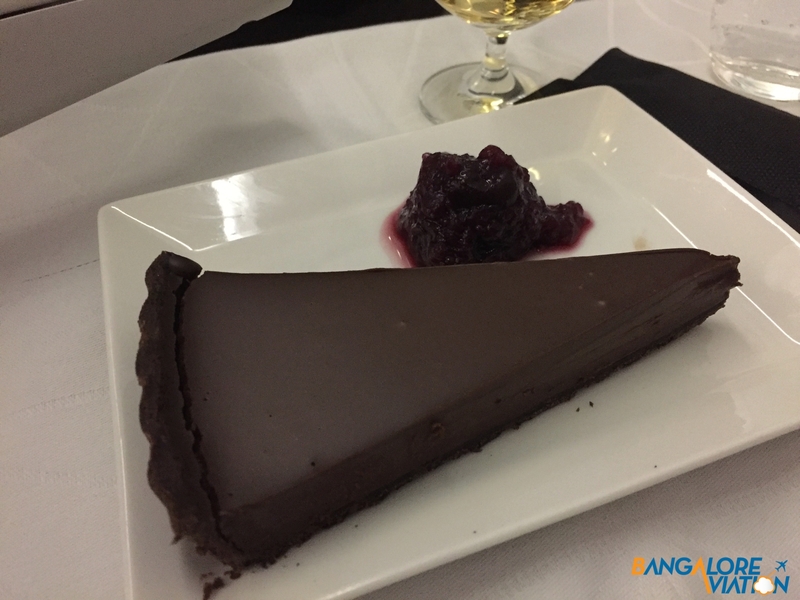 Overall, I found the meal service on Etihad to be strictly average, though their chocolate desserts are very good. Through the dinner service and the entire flight I found the service to be excellent. The crew were attentive, quick and infectiously cheerful. 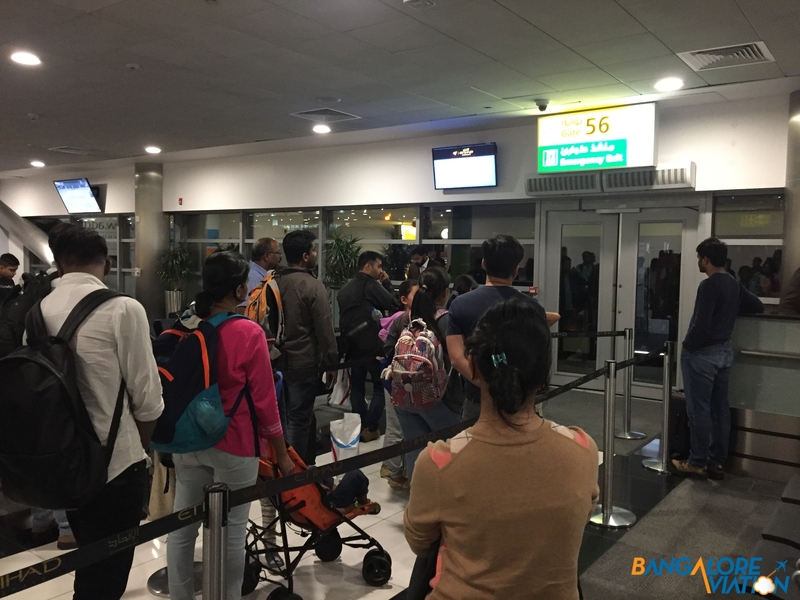 The rest of the flight proceeded uneventfully and we landed at Bangalore slightly after our scheduled arrival time. I wrote to Etihad customer care as requested by the station manager in London, explaining the problem with the chauffeur pickup. After writing to them in July, I finally got a response at the end of September. Their reply stated very unapologetically said that since I was a single passenger the airline policy is to only provide a sedan. So despite both the customer call center and London call center confirming that I would receive a mini van for the pickup – Etihad cannot guarantee that commitment. Because of which they are not responsible for the failure in the pickup. Now I am ok with Etihad only providing a sedan to pick up a passenger, but I would have appreciated being told about that when I requested a bigger car. For the call center to confirm the mini van orally and then to be told that a van cannot be guaranteed is just bad customer service in my opinion. I think it just reflects the current state of Etihad that cost cutting is a higher priority than the passenger experience. 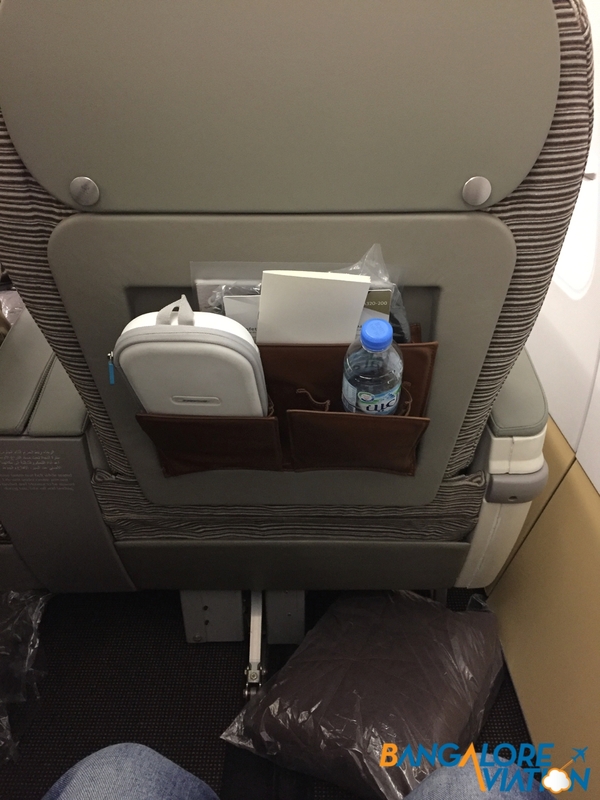 I enjoyed my flight on Etihad’s A320. 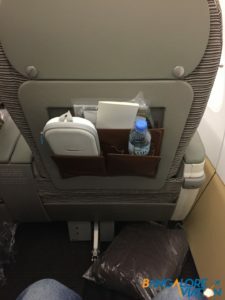 The airline needs to look at an updated hard product for it’s business class with narrow body flat bed options on the rise, Etihad should be looking at one of these options sooner rather than later. While the food onboard was strictly average, the service was great. 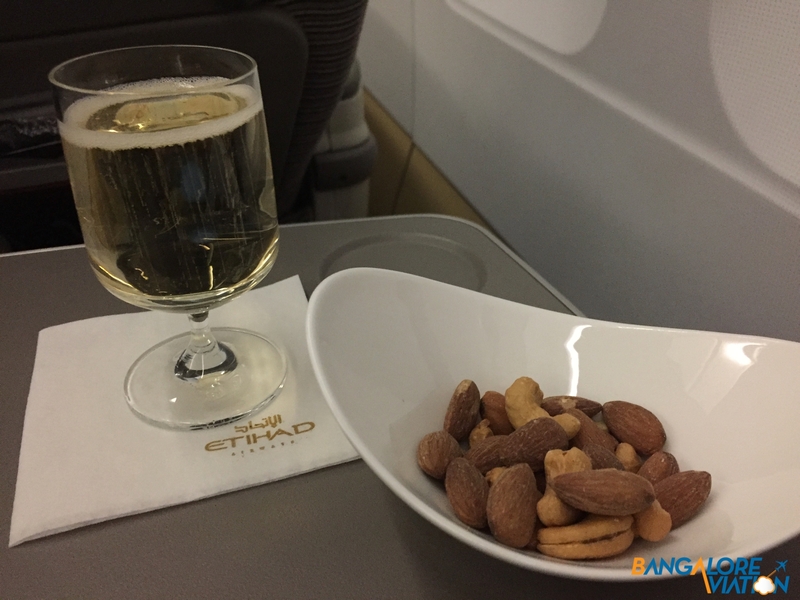 I found overall experience on Etihad to be reasonably decent. While I am personally not a very a very big fan of the hard product on the A380, it is a very solid product and service across both the legs were good. However that being said Etihad’s cost cutting spree is beginning to show when it comes to the passenger experience. Etihad needs to be careful not to slip into the service level of the pack of the European carriers. The airline definitely needs to improve it’s transit experience and customer care which are both sub standard.